Pack of 5 Rhodia Side Staplebound Black Pocket Notebook (3 X 4.75) by Rhodia at LDP Graphic Design. MPN: 119158. Hurry! Limited time offer. Offer valid only while supplies last. The Rhodia Side Staplebound Pocket Notebook (3 by 4.75 inches) is a lightweight notebook, bound on the left, with card covers coated and waterproof. The Rhodia Side Staplebound Pocket Notebook (3 by 4.75 inches) is a lightweight notebook, bound on the left, with card covers coated and waterproof. Sold as a set of 4 notebooks, each with 24 sheets (48 pages) of 80 gram, extra white paper with a smooth satin finish. View More In Steno Notebooks. 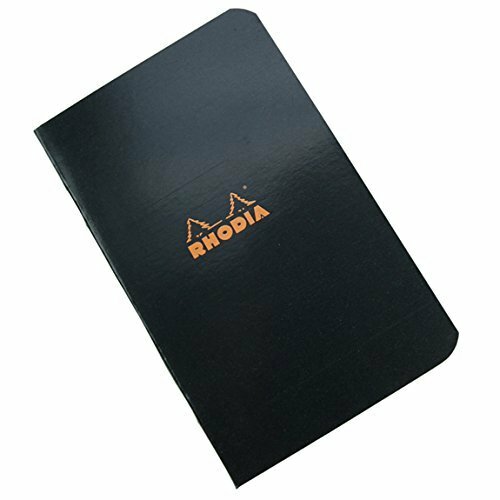 If you have any questions about this product by Rhodia, contact us by completing and submitting the form below. If you are looking for a specif part number, please include it with your message.